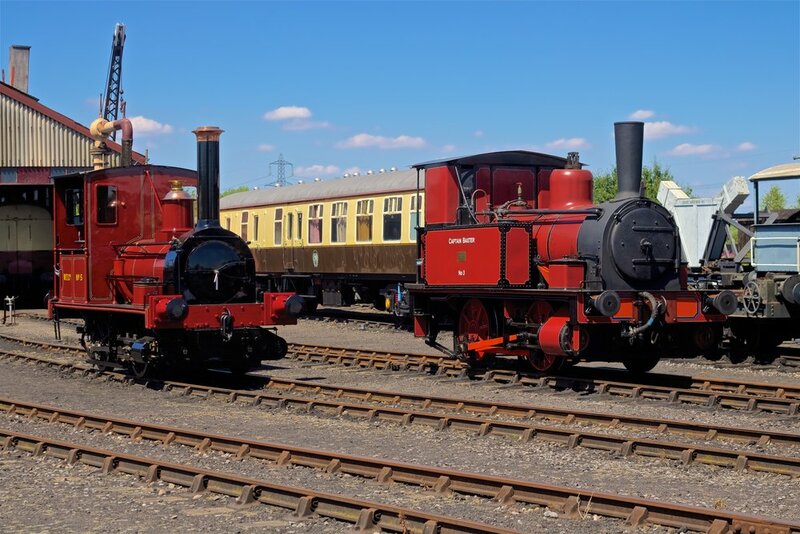 Fletcher Jennings & Co. - "Captain Baxter" and George England and Co. - "Shannon" at the Didcot Railway Centre July 15th. Photo by Gwion Rhys Davies. I e-mailed members earlier in July to advise of the sad passing of John Rogers, following serious complications that set in after heart surgery. John’s funeral took place at St Paul’s Church, Sketty, with well-over 100 attending and a good representation of past and present club members. John will be missed by so many who enjoyed his endless fund of anecdotes and stories of National Service, modelling and transport in the ‘50s and ‘60s. To keep John’s memory alive, it has been decided to rename the Chairman’s Trophy the ‘John Rogers’ Cup’, to beawarded annually to the individual or group who has/have made the greatest contribution to the club throughout the year. Whilst repeated requests for volunteer assistance to help Mal Rowe with this Forth Bridge task have not yielded an overwhelming response, the Test Tracks are now very near to completion. All of the track originally planned has been laid and wiring is well advanced. Following a request from 009 modellers, two inner loops of correct 009 track will be added to the boards shortly and controllers ordered for them. The access-bridge section has also been installed and wired successfully, a very considerable challenge in itself. Little is now required to complete the job beyond laying the 009 tracks, some further wiring and installation of the control panels and cosmetic tidying. It is likely that a low Perspex panel will be fitted to the front of the tracks as before [but lower]. This is currently being costed. Ted Hylton apologises but the planned excursion to Devil’s Bridge has had to be put on hold. It was not possible to book suitable transport at an economic rate over the Bank Holiday weekend as all coach companies reported that they were fully committed. Some of you may have noticed new member Colin Edwards [of Margam] wandering around on Thursday nights! Do take time to introduce yourself if you see him, it’s important to make new members feel at home and part of things early on. Colin will be exhibiting his OO layout, ‘Bovingdon Road’, at our October exhibition. Whilst the AGM is still some months away [January 2019], time will fly and it will be upon us quite quickly. Consequently, it is not too soon to start thinking about next year’s Committee elections and the role which Club members may be able to play within it. At least one long-serving officer [the Secretary] will be standing down and others may choose to do so too. New blood will be required to manage the club’s affairs and members may wish to start thinking about whether they would want to stand for election themselves. Ideally, a commitment of three or four years would be helpful, to enable a rolling succession plan for the Committee to develop and so avoid any future multiple stand-downs. If you are interested in discussing this, please do collar a Committee member to talk further. More information will follow in due course. ‘...We're hosting a salute to 70 years of the legendary Land Rover. Entry will be £3 per person, £1 children or £10 for a family of 4. The event will feature Land Rover vehicles of all shapes and sizes. Young and old, posh and not so posh, shiny and muddy. There will be stalls, refreshments and other incidental events. Visitors will have the opportunity to vote for their favourite vehicle for which there may well be a trophy. Make a date in your diary: Sunday, August 19th. For more info phone 01792 732832...’. The event starts at 10.30am and finishes at 3.30pm. There will also be an opportunity to view some of the Museum’s buses and the Club will have a stall there, selling our Tirdonkin wagons and, hopefully, recruiting new members. The venue: Unit 2, Viking Way, Winch Wen Industrial Estate, Swansea SA1 7DA. I recently came across this interesting photograph showing the ammunition filling and storage tunnels at the Royal Ordnance Factory in Bridgend during its construction in the last war. The ROF, which covered a huge site at Brackla [and some of the remains of which are still visible], had its own temporary platforms built for workers travelling in from surrounding areas. Coincidentally, the Welsh Railways Research Council [of which the Club is a member] published a number of articles about the railway links to the ROF site: these may be read in the WRRC journals held in the club’s library. The sharp radii of these rail entrances to the ammunition storage tunnels would have required short wheel-base stock. Locomotives used included 8 very short wheel-base Fowler 0-4-0 diesels [some classified as DMF: ‘Diesel Mechanical Flameproof’]. There was also one Peckett 0-4-0 Saddle Tank. The Bridgend ROF was the largest in the UK and employed over 40,000 people at its peak. Construction started in early 1938 and completed in 1940. Officially known as ‘Filling Factory No 2’ it had an astonishing 24 miles of internal railway [built by the GWR]. The ROF closed in 1945. Another advance notice! Next year’s modelling competition will be judged on the 28th. March 2019. This year’s event was the best ever and saw some truly outstanding entries. Help to make next year’s even better! Start thinking now about what you’d like to submit and I shall attach the rules [with slight revision] with the September newsletter. A gentle reminder! Could Shed Masters please remember to pass requests for purchases through Mal Rowe for approval prior to placing orders. Many thanks. 19th August – Swansea Bus Museum – 70th. Anniversary of the Land Rover exhibition. 18th / 19th August – Ross-on-Wye Model Railway Show – John Kyrle High School - HR9 7ET. 25th / 26th August – Machynlleth Model Railway Show – The Plas – SY20 8ER. 25th / 26th August – Burnham Model Railway Show – King Alfred School – TA9 3EE. 26th / 27th August – Swansea Society of Model Engineers Open Days – Gwern Einon Road – SA2 8EA. 6th / 7th October – Swansea Model Railway Group 2018 Show – LC Oystermouth Rd Swansea – SA1 3ST. 8th November – ‘Kit Bashing at 12 inches to the Foot: the GWR County Project’, a lecture by Terry McCarthy on this fascinating new-build project. Most of the above events have websites or Facebook pages – please check them for further details in case of short-notice changes.